Given the sparse coverage of female entrepreneurs, Lu decided to focus on filling that gap. 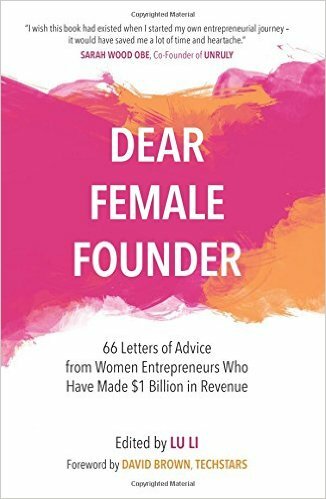 She asked 66 female entrepreneurs to write a letter to the next generation of entrepreneurs; then edited it into a stunning book called Dear Female Founder. Together the 66 entrepreneurs in the book are responsible for over $1 billion in revenue combined. 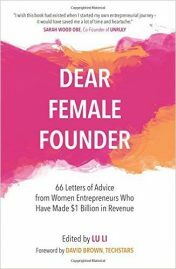 In the book, you will find invaluable insights from 66 inspirational women sharing business advice they wished someone had told them when they started out. The chapter contributors include Alex Depledge from Hassle.com (£40m exit), Gini Bianchini from LeanIn.org and Mightybell, Paulina Sygulska from GrantTree, Danae Ringlemann from Indiegogo, Alice Bentick from Entrepreneur First, Debbie Wosskow from LoveHomeSwap and Reeshma Sohoni, to name but a few!